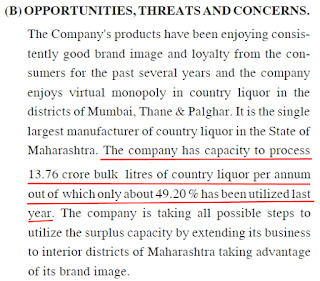 This article provides in depth fundamental analysis of GM Breweries Ltd, an Indian country liquor manufacturer, focusing on the Mumbai & Thane markets in Maharashtra. Thank you for all your blog and articles. It has been important in making my foundation of stock investments. I am learning and following your blog since a year. 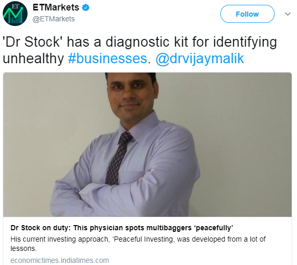 In fact, I am into stock market since a year. I have read many of your analysis articles multiple times, as initially, I was new to everything. However, now I have reached the stage where I am at least able to analyse something. All that is because of the repeated readings of your articles. 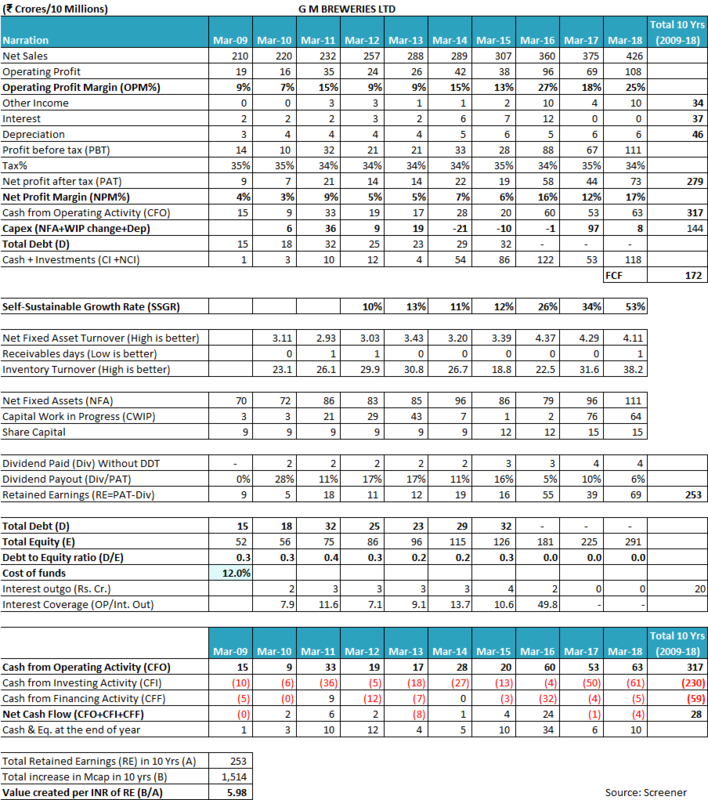 Here is the analysis was done by me on GM Breweries Ltd. 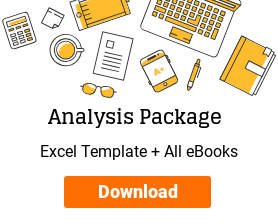 I am sending you this analysis because I want to know that how can you dig the analysis further, which will definitely make me and others learn more. India’s economy is one of the fastest growing economies in the World. As per 2016, 66% of Indian population is in legal drinking age and it is expected to rise to 68% in 2021. Spirits sales in India was 293 million cases in the year 2016 and is expected to reach 363 million cases by 2021. GM Breweries Ltd was incorporated in the year December 1981. The company is engaged in the manufacture of alcoholic liquor. It blends and bottles alcoholic liquor and concentrates more on country liquor. It has its manufacturing unit in Thane district of Maharashtra with installed capacities of 82.6 million bulk liters of country liquor and 12.4 million bulk liters of Indian made foreign liquor. The company markets its products brandy, rum and whiskey under brand names Pioneer Doctor Brandy, Pioneer Special Doctor Brandy, Hot Shot Rum and Reporter Choice Whiskey. The company has imported oakwood barrels to mature the whiskey in order to impart the liquor with the correct character, color, strength and distinctive taste. The company has a major presence in Mumbai, Navi Mumbai, and Thane and is the single largest manufacturer of country liquor in Maharashtra. 1981 – The company was incorporated in December. 1990– The company became public in August. It has substantial market share in the country liquor segment in Mumbai and Maharashtra. 1993 – 23,24,900 equity held by promoters. 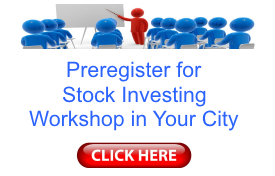 – 14,27,100 equity shares of Rs 10 each for cash at a premium of Rs 5 per share allotted to promoters. 6,71,800 equity shares of Rs 10 each at a premium of Rs 5 per share allotted to NRI’s on preferential basis. 49,60,100 equity shares of Rs 10 each at a premium of Rs 5 per share allotted to the Indian public. 2010 – GM Breweries Ltd has informed that the Board of Directors of the Company at its meeting held on January 21, 2010, has appointed Paresh N. Trivedi as an Independent Non Executive additional Director. – GM Breweries Ltd has informed that the company has appointed Sandeep Kutchhi as a company secretary with effect from September 04, 2009. Authorised shares = 70,000,000 of which 10,000,000 is unclassified. Issued shares = 14,622,000. There is a high probability of issuing bonus shares. However, bonus shares have their own pros and cons. Sales have grown since 2010 up to 18% recently, with one major spike of 277% in 2017. A sudden spike in sales can be due to banning of poisonous cheap alcohol in Maharashtra, which might have led to an increase in sales of country liquor. OPM has been high and low over years with recent being 7%. This decrease in OPM is seen despite a decrease in raw material, employee/selling and admin/Power and fuel expenses. This is not understandable as with a decrease in expense there should be an improvement in OPM. The tax rate seems reasonable at around the 35%. The company has about 2% of its revenue as other income. 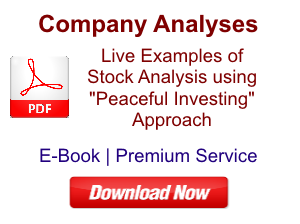 It is primarily from interest and dividends, which suggest that it has largely invested in FD and MF. Total financial investment can be seen as 10768.85+1801.68 Lakhs=12570.53Lakhs i.e. 126 Crores. CFO is steadily rising. Capex is 144. Free cash flow is about 172, which is 54% of CFO. Asset turnover: It has steadily increased recently being 15.5 which means the company is making good use of its fixed assets. Receivable days: is around 0.1 recently gradually reduced over years. Inventory turnover ratio: is 143 (gradually raised). ROE and ROCE: is average around 24% and 26% respectively. Cumulative Net profit/CFO = 376/318, which means the company is able to nicely convert its profit into cash. SSGR: is 65%, which is more than sales growth. 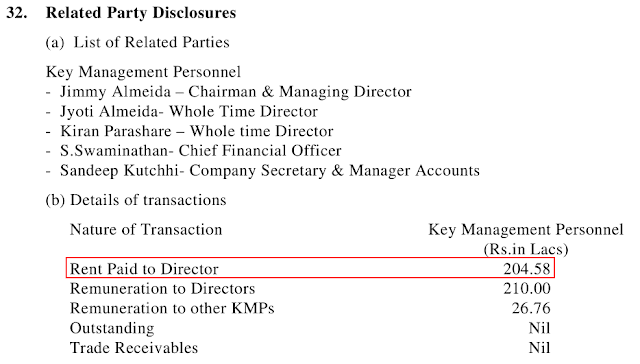 The total salary of six peoples (1 Chairman, 2 WTD, 3 Independent directors) is eight Crores. The Chairman takes about 1.32 Crore per annum in salary, which is 1.8% of net profit. He has not taken any remuneration in 2018. Promoters hold 74.43%. DII have raised their shares from 0.06% to 0.09%. FII have raised their shares from 1.33% to 2.19%. I could not find any controversy and frauds. 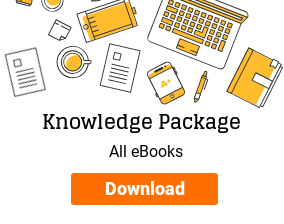 – 42% of its unit being utilized currently. So need of expansion for at least 5 yrs. 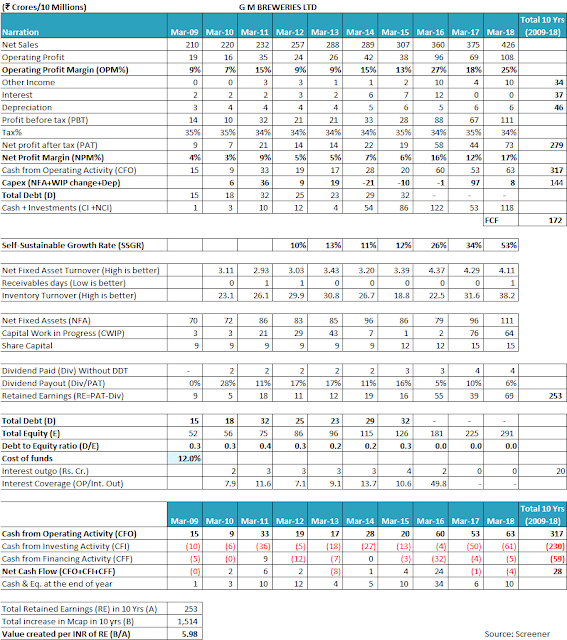 GM brew has more than the average industry CAGR of 22%. Comparatively, it has no debt; it has good profit growth. Compared to large stocks in the industry, it lacks in making brand value. It has less market coverage. Comparing with Radicokhaitan (RK): RK has a huge market with big brands and is large player. However, with that, it also has debt, poor ROE. When compared to industry, it is much like yet a toddler. Sorry if it sounds funny. We can say in approx. 1,000 Rs we are getting machine making 49 Rs per yr. with Bonds/MF/FD of 86 Rs. So, total (49+86) =135 Rs. If all is well and it gives 20% return annually (eps growth 13-15% and funds return 5-7%), then it will take 10 years to convert 135 Rs to 1000 Rs. If with its current 135 Rs, its Market price is Rs 1000, after 10 years with more grown eps and funds its price can be expected much higher, provided all is going well. Overall company is rich and has good and profitable core function, with zero fraudulent activities by the management. Currently, however, the company is accumulating much of its profit in financial assets. Instead, it should expand its market coverage to other parts of the country as well as out of the country and try on making big brands. When looking at its milestones above, it has not done any wonders – no new expansion/no new brands launching. It is difficult to be certain about how the company will expand/launch new brands going ahead. Thanks for sharing the analysis of GM Breweries Ltd with us! We appreciate the time & effort put in by you in the analysis. Let us analyse the financial performance of GM Breweries Ltd. While analyzing the financials of G.M Breweries, an investor would note that since FY2018, the company has started reporting its financials in compliance with new accounting standards (IndAS). As a result, in FY2018 annual report, the company has reported its sales including various indirect taxes like state excise duty, value added tax (VAT) etc. for the current year, FY2018, as well as the previous year, FY2017. In the past, the company has been reporting only net sales excluding these indirect taxes in the profit and loss statement. 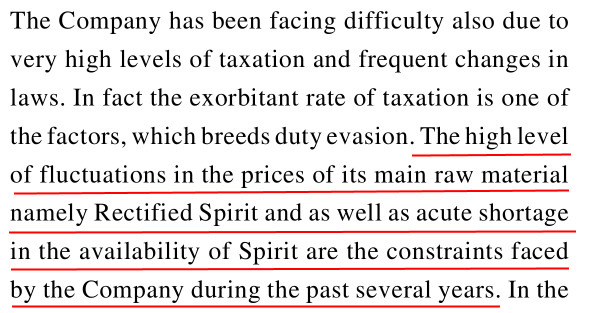 A look at the detailed sales breakup in the FY2018 annual report, page 55, will indicate to an investor that out of every ₹100/- of sales, the company has to pay about ₹72/- to the govt authorities as indirect taxes (state excise duty: 45% and value-added tax: 27%). Therefore, it becomes essential that an investor adjust the reported sales data in the publically available historical data so that she compares the net sales of every year in her analysis. If the investor does not make this adjustment, then it may lead to erroneous calculation and interpretation of all those ratios, which include sales as a parameter like sales growth, net fixed asset turnover (NFAT), receivables days, inventory turnover etc. As a result, in the analysis ahead, we have adjusted the sales data to reflect the net sales for FY2017 and FY2018. 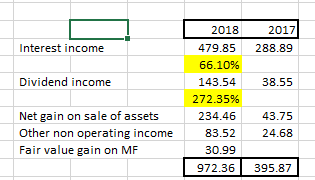 Looking at the financial data of GM Breweries Ltd for past 10 years (FY2009-18), an investor would notice that the company has grown its sales at a moderate pace of 8-10% year on year from ₹210 cr in FY2009 to ₹426 cr in FY2018. An investor would also notice that the company has witnessed many fluctuations in its operating profit margin (OPM) over the years. The OPM of the company has been as low as 7% in FY2010 and as high as 27% in FY2016. OPM has been showing cyclical patterns during the last decade. Investors would note that the fluctuating OPM for any company is a sign of inability to pass on the changes in the raw material costs to end customers. It may be due to the low bargaining power of the company over its customers due to intense competition in the industry. A company may also face fluctuating OPM in cases where the prices of the products are regulated and the company may not change them as per its will. In case of GM Breweries Ltd, over the years, the company has not been able to pass on the prices increases of key raw materials like rectified spirits. As a result, its profitability has suffered. 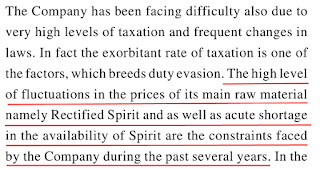 The company highlighted this constraint to the shareholders in its FY2010 annual report, page 8. The company mentioned that it had to take a hit on its profits to maintain its sales, which seems a direct result of the competition among country liquor manufacturers. Therefore, an investor would note that the company might find it difficult to keep its profitability levels at high levels in future. Changing raw material prices and intense competition in the country liquor industry might put pressure on the product prices of GM Breweries Ltd. Therefore, we believe that investors should keep a close watch on the profit margins of the company in future. The net profit margin (NPM) of the company has followed the trend of the OPM over the years. Over the years, GM Breweries Ltd has a tax payout ratio of 34-35%, which is in line with the standard corporate tax rate prevalent in India. We primarily focus on net fixed asset turnover (NFAT), inventory turnover ratio (ITR) and “receivables days” parameters to assess the operating performance of a company. In case of GM Breweries Ltd, the company has frequently changed the classification of its investment in property between the capital work in progress (CWIP) and non-current assets. This reclassification changes the value of fixed assets (net fixed assets + CWIP), that we use to arrive at NFAT (Sales/fixed assets). As a result, the NFAT of the company over the years may not be comparable over the years. In the FY2014 annual report at page 22, an investor would notice that the CWIP of the company has witnessed a steep decline from ₹42 cr in FY2013 to ₹6 cr. An investor would note that there is no corresponding increase in the fixed assets in FY2014. Instead, the non-current investments have increased from ₹0.02 cr in FY2013 to ₹49 cr in FY2014. Moreover, while analysing the detailed notes to the financial statement of the FY2014 annual report, at page 27, the investor notices that the non-current investments have increased during the by about ₹46 cr on account of investment in property. The removal of an amount of ₹40 cr from fixed assets to investments impacts the calculation of NFAT (= sales/fixed assets). It also impacts the calculation of cumulative capital expenditure (capex) over the years as the resultant decline in fixed assets, on an overview, presents itself similar to the sale of assets (liquidation/negative capex). As mentioned earlier, GM Breweries Ltd has started using the new accounting standards (IndAS) and has accordingly changed its reporting of financial numbers. In FY2018 annual report, at page 50, an investor would notice that now the company has reversed the practice of showing investment in property under non-current investments and now it is showing it under capital work in progress (CWIP). Because of the change in classification of the expenditures between CWIP and Non-current investments, it becomes difficult to calculate and interpret the ratios, which use fixed assets e.g. NFAT. However, an investor would notice that the company has been able to increase its sales over the years and has simultaneously repaid its entire debt. This indicates that the company has been making good use of its assets. An investor would also notice that the company is currently using only about 49% of its manufacturing capacity of country liquor, which leaves sufficient room for future growth without the urgent need of any large investment. The inventory turnover ratio (ITR) of the company has been varying year on year. However, over the years, the ITR has improved from 23 in FY2010 to 38 in FY2018. Increase in ITR indicates an improvement in the efficiency of inventory utilization over the years. An investor would notice that GM Breweries Ltd has almost nil receivables days year on year. It indicates that the company sells most of its products (country liquor) on advance payment/over the counter payment basis and does not provide any credit period to its customers. An investor would appreciate that if a company collects all the money from its customers upfront but receives a credit period from its suppliers/vendors, then effectively, the suppliers are funding the inventory of the company. Such a situation eases out the working capital burden on the company and helps it to maintain its debt-free status. The efficient collection of receivables and inventory management also becomes evident when an investor compares the cumulative net profit after tax (cPAT) and cumulative cash flow from operations (cCFO) of the company over the years. Over FY2009-18, GM Breweries Ltd reported a total cPAT of ₹279 cr. whereas during the same period, it reported a cCFO of ₹317 cr. An investor would notice that over the years, GM Breweries Ltd has witnessed an SSGR of 25-50% whereas the company has been growing at a rate of 8-10% over the years. Therefore, it seems that the company is growing at a pace, which it can afford from its business profits. As a result, during FY2009-18, the company has increased its sales and at the same time has paid off all the existing debt. While analysing the free cash flow (FCF) position of the company, an investor notices that over FY2009-18, GM Breweries Ltd generated a total cash flow from operations (CFO) of ₹317 cr and it did a capex of ₹144 cr over the years to grow its revenues from ₹210 cr in FY2009 to ₹426 cr in FY2018. As a result, the company had an FCF of ₹144 cr. The company seems to have utilized this FCF to repay the existing debt, meet interest expense, pay dividends etc. The balance amount is available with the company in the form of cash & investments of about ₹118 cr. The company has demonstrated the ability to grow without putting the burden on the financial resources, good working capital position, ability to pay dividends from business profits and generate surplus cash. This ability seems to have been recognized by the market and as a result, over last 10 years, the company has been able to reward its shareholders with an increase in market capitalization of ₹1,514 cr against retained earnings of ₹253 cr. This amount to the creation of a wealth of about ₹6 for every ₹1 of earnings retained by the company. In FY2011, Ms. Celina William Almeida resigned from the position of Chairperson of the company and her son Jimmy William Almeida was appointed as Chairman & Managing Director of the company. In FY2012, John William Almeida who seems brother of Jimmy William Almeida resigned from the company, thereby ceding full control of the company to Jimmy. Currently, Jimmy William Almeida and his wife Smt. Jyoti Jimmy Almeida are the members of the promoters’ family who are running the business. They are currently in the age bracket of about 50-60 years. The annual reports do not provide information whether any person from the next generation of the promoters has joined the company. Therefore, we believe that investors should assess what are the management succession plans of the company by taking clarifications from the company. As per FY2018 annual report, page 62, the company has been paying ₹2 cr as rent to one of the directors, which is a related party. Investors may seek clarification about the property for which the company is paying rent to the director and then assess whether the rent amount is in line with the market prices. This is because a rent payment to a related party, which is higher than the market rate, would amount to taking the economic benefit away from the company at the cost of public shareholders. In the FY2018 annual report, at page 51, the company has disclosed that it has non-current investments of ₹107 cr. However, the company has not provided further details about the names of the mutual funds, tax-free bonds, preference shares and equity shares where it has invested this money. While reading annual reports of many other companies, investors would notice that the companies provide names of each mutual fund scheme, equity shares etc. where they have invested their money. This information is essential to understand the risk taken by the company in its investments, which are of significant size. Therefore, we believe that investors should ask for details of these investments from the company for further analysis. In FY2018 annual report, page 17, the company has disclosed that it does not provide any incentive to its employees based on the business performance of the company. As a result, the employees are eligible only for a fixed remuneration irrespective of company’s performance. 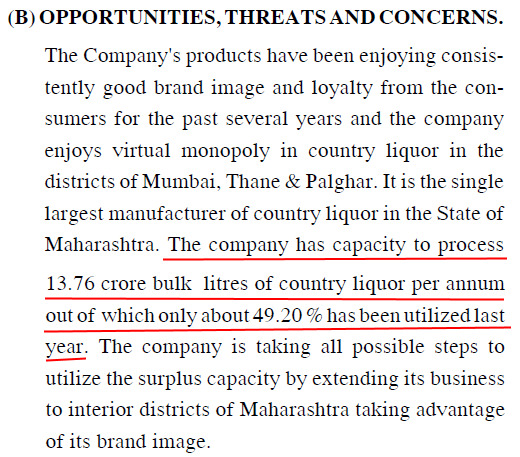 It might be that the company believes that the sales of its core product, country liquor, are self-driven. As a result, it does not feel the need to incentivize its employees to work harder for better performance by giving them bonuses linked to company performance. However, investors would appreciate that the lack of performance bonus may make the employees very rigid and inflexible in their approach to business. We believe that investors should understand more about the actions being taken by the company to keep its employees motivated for improving the business performance. This is because the employee motivation is essential for future growth of any company. As per the corporate announcements of the company on Bombay Stock Exchange (BSE), the company declared its Q4 and full year results for FY2018 on April 5, 2018. Investors would appreciate that preparation of annual account within three working days (April 2, 3 and 4, 2018) is a very quick performance for a company, which has the gross sales of about ₹1,600 cr including more than thousand crores of tax liabilities, inventory distributed over distribution channel, 171 total employees, and vendor assessments etc. It would have been a very efficient execution by the teams of employees of the company to accurately ascertain the exact stock, payments due including any disputes within three working days. Moreover, it also indicates the fast pace at which the auditors of the company would have worked to accurately assess all the claims made by the company within those three working days. We hope that the efforts of the company to prepare the final accounts and the efforts of the auditors to check them as quickly as within three working days would not have led to any errors. As the audit usually involves making sample checks of bank accounts/fixed deposits/mutual funds by contacting the banks/AMCs, contacting a few vendors to verify their claims as well as verifying a few inventory samples, we believe that all these activities would have been properly undertaken within the three working days. Currently (June 1, 2018), GM Breweries Ltd is available at a price to earnings (P/E) ratio of about 21, which does not offer any margin of safety in the purchase price as described by Benjamin Graham in his book The Intelligent Investor. Overall, GM Breweries Ltd seems to be a company, which has been growing at a moderate pace of 8-10% over the last decade. The company faces competition in its key market segment of country liquor. As a result, it has not been able to pass on the increase in its raw material costs to its customers. Therefore, the profit margin of the company has been fluctuating over the years. The company sells its products on advance/over the counter payment basis and as a result, it receives almost all of its sales revenue upfront. Such nature of its business helps the company to contain its working capital requirements because the suppliers who provide the company a credit period end up funding the inventory of the company. The company has been able to use its assets efficiently and as a result, it has been able to grow using its business profits. The company has paid off its debt. The company is utilizing only half of its manufacturing capacity and therefore, may not need to do large capital expenditure for growth in existing markets. The annual reports of the company do not provide information on future succession planning. 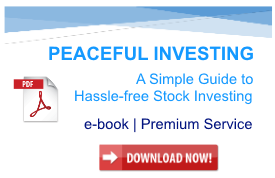 Therefore, investors may seek this information from the company directly. Investors may also contact the company about the details of non-current investments, the property taken by the company on rent from directors, steps taken by the company to keep the employees motivated in the absence of bonus linked to business performance. Investors may also ascertain whether the company and the auditors are able to appropriately conduct all the required procedures needed for flawless account preparation and their subsequent audit before disclosing the audited financial results of the full financial year to the shareholders within three working days from the end of financial year. We believe that going ahead; investors should monitor the profit margins of the company, signs for management succession planning and any deterioration in receivables days. These are our views about GM Breweries Ltd. However, investors should do their own analysis before taking any investment related decision about the company.